We Got The Solution! A Flashpoint Blog: More September 2009 Flashbits! This Week’s Upcoming Episode Will Be A Shocker! FLASHPOINT returns with its most emotional and unforgettable episode ever as the SRU is pushed to the breaking point and desperately work to save the life of one of their own. After answering a bomb call in the downtown core the team soon discovers it’s just the first in a wave of bombings by a mysterious eco-terrorist organization. Ed (Hugh Dillon), Sam (David Paetkau) and Wordy (Michael Cram) must hunt down the terrorists, while bomb defusing experts Spike (Sergio Di Zio) and Lou (Mark Taylor) must defuse two bombs simultaneously. The only cast members we can confirm at this time are Richard Willis, who plays the character Sheldon Kominski, and Toronto actor Drew Finnie makes another of a few appearances on the show. CTV's Forums are all abuzz with who the unfortunate member of the team might be, and if it is who we think it is, we'll be left wondering where the series is going to go. On a side note, I am definitely going to change the format of the episode summaries (yes, I will attempt to use paragraphs). If I have a laptop (which I am hoping one of my broken ones will return to me from the shop soon), then it will be up hours after the episode airs. If not, then I'm stuck doing it on this PC, and that won't happen until CTV puts the episode up online. We will hide the full summaries after the post jumps, so those of you who don't want to be spoiled, won't be :). We're excited and only 5 days away from a premiere! Keep an eye out on our ratings table too - this will be updated as soon as we have the figures in! Simon Vaughan Starts New Company! Well, it seems one person that left the fledgling Alchemy TV has started their own venture. Simon Vaughn, co-founder and partner at Alchemy, left the company last year, and just recently announced that he is starting his own company, Lookout Point. The company will producers secure funding for their projects via pre-sales, co-production and bank and equity financing. Since this is a solo project, Simon will serve as an Executive Producer on future productions, but will not serve as a distributor. He spoke of his philosophy, "I want to sit on the same side of the desk as the producer and have the flexibility to get involved with the best projects and help make them happen. It is important to have maximum mobility, so I can work with networks, studios or production companies without treading on the toes of their own in-house distribution entities. Being less of a competitor and more of a partner is very liberating and gives me access to a wider range of the best projects." Vaughn plans to focus on series and movies. Simon isn't quite done with Alchemy just yet, as he is nominated this month for an Emmy for his work on their production, Coco Chanel (Outstanding Made for Television Movie). Alchemy continues to be a key production partner of Flashpoint. Flashpoint’s Second Season Premieres in Italy! We wonder if Spike cozied up to Babycakes and watched! 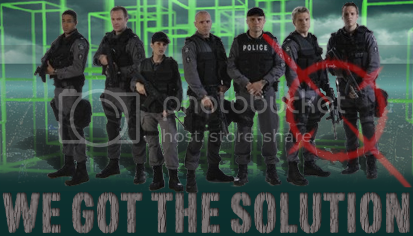 Flashpoint continues its conquest of the world, and the second season of the show began in Italy on September 8th on AXN. The first season of the show reruns in syndication on RaiTre (Rai3) and so far the ratings have been good on both channels. On September 10th, approximately 1,224,00 people watched Scorpio and the show held a 5.23% share. Mark Ellis reports that 1.3 million people caught the premiere on AXN! Fans can catch watch Flashpoint in this Autumn 2009 promo video from AXN! Viva la Flashpoint! 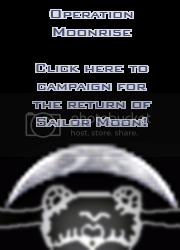 The fans are really putting up a fight to bring back Sailor Moon, and we want to thank the readers of this blog who weren't afraid to check out a little more about Flashpoint's very big connection to an iconic cartoon, and in turn participated in our surveys. We have received over 1000 surveys from fans over Phase 1 and 3 of Operation Moonrise - which is a really big number none of us ever expected to reach! We'll be finishing up the release survey a week from today, so if you want to get involved this is your very last chance! this tv show is very good. I am watching this tv show regularly. And I have watched its 3 season. But I have missed the episode 4th of season 3. Now I am seeking good site to watch Flashpoint episodes online. this is my favorite tv show. USA Badgers and Doves Looking For Flashpoint?